What better way to see the splendour of New York City than through the eyes of its Superheroes?! 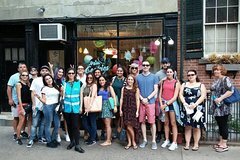 our world famous Superhero Tour of New York visits film locations from the major Hollywood blockbusters as well as real life comic locations. The Superhero Tour of New York shows you firsthand the prime hangouts of radioactive latex loving spider heroes, vigilante bat-people and delves deep into the benefits of wearing spandex briefs... Did you know comic books and superheroes were invented in New York in the 1930s?! The city continues to cast its influence over the genre to this day in both comics and films. In the DC Universe New York is the inspiration for both Gotham City and Metropolis. And in the Marvel Universe characters such as Spider-Man, the Avengers, Ironman and the Fantastic Four inhabit the real New York. See it all on the Superhero Tour of New York! • Empire State Building The NY landmark has featured in countless Superhero adventures, find out which ones! • The apartments of Lernore Lemmon (suspected of killing George "Superman" Reeves ) and across the street Kirk Allan (the first Superman 1948) - no they did not knew each other!